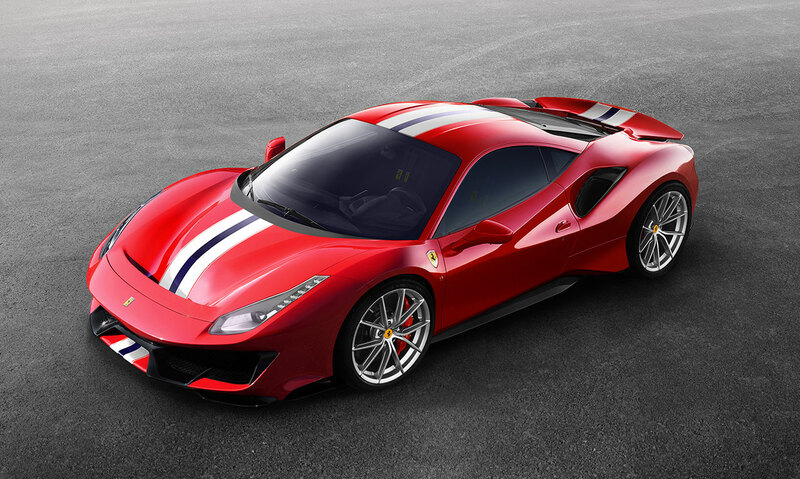 The Ferrari 488 Pista, which will be unveiled at the upcoming Geneva Motor Show, is the successor to Ferrari’s V8-engined special series - the 360 Challenge Stradale, 430 Scuderia and 458 Speciale – which have received critical acclaim for their performance and undiluted handling. The Ferrari 488 Pista marks a significant step forward from the previous special series in terms of both sporty dynamics and for the level of technological carry-over from racing. The name is, in fact, a direct homage to Ferrari’s unparalleled heritage in motor sports. The car’s development evolved directly from the company’s involvement in the FIA World Endurance Championship - where it has won five Manufacturers’ titles in the GTE class in the six years since the series’ inception, taking 29 out of 50 races - and 25 years’ experience in running the Ferrari Challenge one-make series. 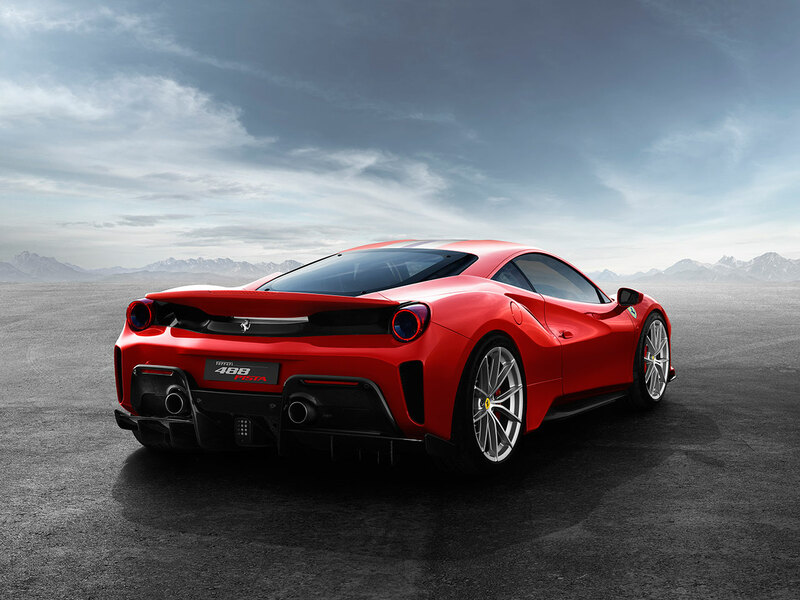 The Ferrari 488 Pista’s extensive weight saving solutions, along with engine, vehicle dynamics and aerodynamic developments all derive from Ferrari’s racing cars: the 488 GTE and the 488 Challenge. The result is a car with an uncompromising mission: to offer track-like performance on and off the road, even when in the hands of non-professional drivers. Compared to the 488 GTB, the new model weighs an impressive 90 kg less (1280 kg dry) which, when combined with the largest ever increase in engine power for a special series car (+50 cv), results in a new benchmark for Ferrari’s V8 sports cars. 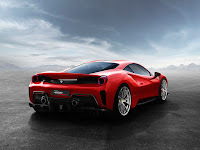 Its engine is the most powerful V8 in Ferrari history and is an extreme evolution of the turbo unit that has won the overall International Engine of the Year award titles in both 2016 and 2017. It punches out 720 cv with the highest specific output of in its class (185 cv/l) and is now lighter too, thanks to solutions adopted from the 488 Challenge, including Inconel exhaust manifolds and lightweight crankshaft and flywheel, but also thanks to additional features, such as titanium con rods and carbon-fibre intake plenums. 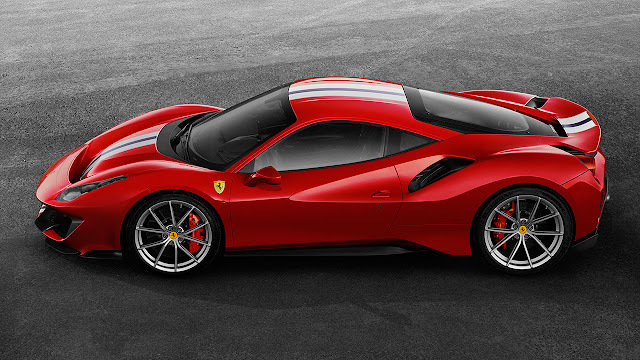 The 488 Challenge also supplies the turbos with integrated rev sensors along with the design of the air intake line which has been moved from the flanks to the rear spoiler area to ensure a cleaner flow of air. Torque is higher than the 488 GTB at all engine speeds, delivering a feeling of consistently smooth, powerful acceleration with even faster turbo response times despite the increase in power. The engine sound is unique and unmistakably Ferrari, as such a special car warrants. 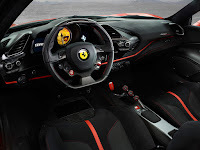 Both the sound quality and the intensity are higher than the 488 GTB in all gears and at all engine speeds in proportion with the progressive increase in power. 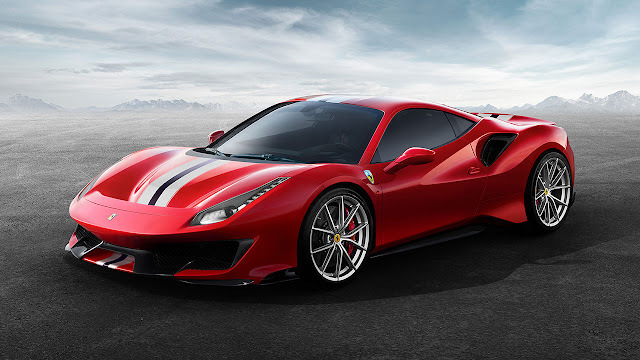 The Ferrari 488 Pista makes full use of Ferrari’s motor-sports experience for maximum aerodynamic performance even on the road. Among the racing solutions adopted is the front F1-inspired S-Duct and the design of the front diffusers which feature a ramp angle that was optimised for the 488 GTE to create strong suction for increased downforce. The underbody vortex generators have also been redesigned, and the rear diffuser incorporates the same double kink as the 488 GTE to increase the air extraction and downforce generation compared to a traditional diffuser. In addition, the rear blown spoiler is higher and longer and the shape has been optimised. The final result of all these interventions is an impressive 20% increase in downforce. The vehicle dynamics were designed to enhance driving pleasure and make the car’s full potential available to all drivers, professional or otherwise. The objective was to make the car’s performance on the limit easier to reach and control. This was achieved by synergies between the development of the mechanical set-up and the electronic dynamic controls integrated into version 6 of the Side-Slip Angle Control system. 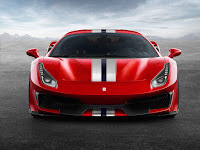 SSC 6.0 incorporates all the following systems: E-Diff3, F1-Trac, the magnetorheological suspension (SCM) and, for the first time ever, the Ferrari Dynamic Enhancer. The FDE features a world-first: it uses Ferrari software to adjust the brake pressure at the callipers. This additional level of control further fine-tunes the Ferrari 488 Pista’s performance through, and powering out of, corners making the car’s handling even more effortless, intuitive and predictable. The extra confidence the system gives means that drivers can more easily control yaw angles, even on the limit, and develop a completely symbiotic relationship with the car resulting in the perfect combination of genuinely extreme performance and driving thrills. The suspension set-up is completed by new tyres developed specifically for the car by Michelin. 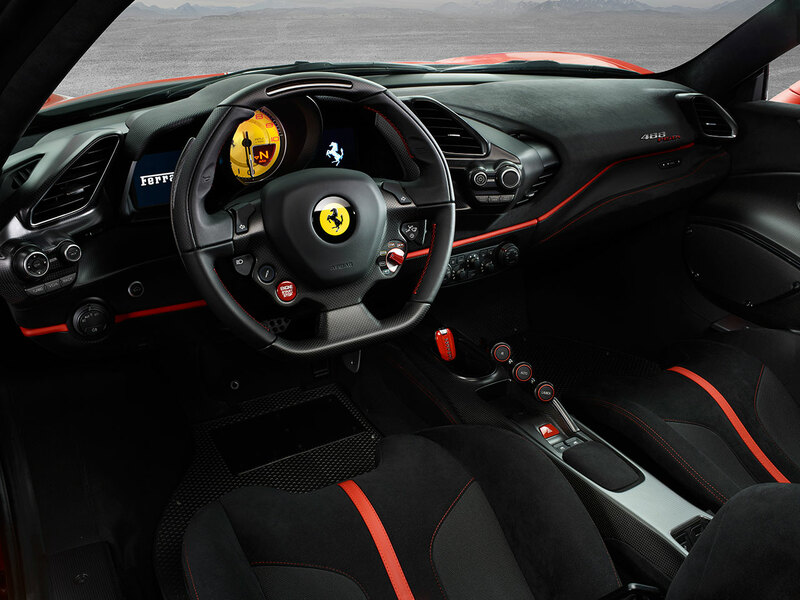 The design of the Ferrari 488 Pista is focussed on functional aerodynamic concepts while the cockpit is pared back in keeping with its very sporty vocation. Ferrari Design used innovative elements, such as the aerodynamic S-Duct at the front, as an opportunity to visually shorten the car’s nose, creating an original floating wing effect. 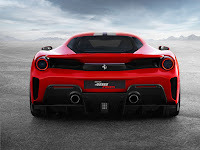 The racing livery colour scheme is an integral part of the design of the car and the way it dives into the S-Duct underscores the berlinetta’s compact yet imposing forms. Contrasting edging on the aerodynamic elements on the bumpers and flanks add structure to the design. The concept of the front is echoed in the dolphin-tail rear spoiler which appears suspended to provide an impression lightness and efficiency, while the rear volumes add a sense of power to the tail. The car’s underlying sense of extreme purpose is also highlighted by the adoption for the first time on a Ferrari of optional new 20” carbon-fibre wheel rims, while other carbon-fibre parts include the engine cover, bumpers and rear spoiler.